20 Easy Egg Recipes From Our Readers: Say Goodbye to Boring Breakfasts! 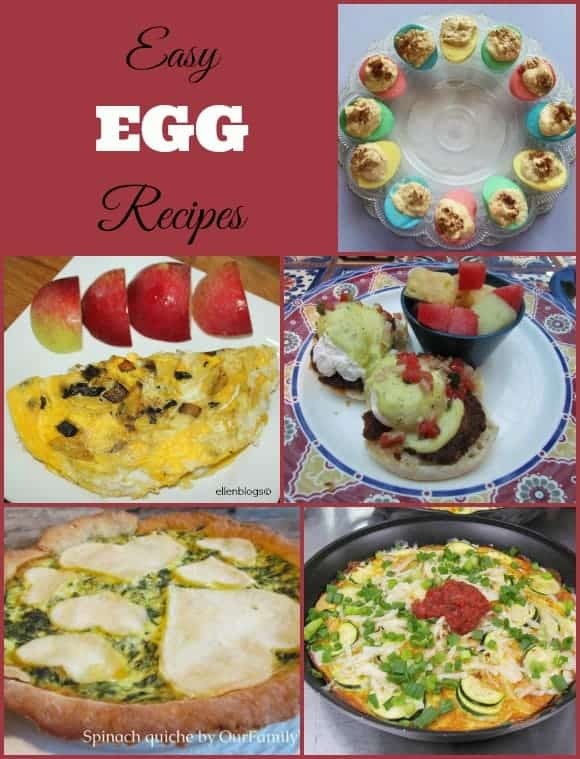 I am always looking for easy egg recipes for my family! It seems that I cook the same things over and over: crepes or cookies! It can get boring! I wanted some inspiration! So I asked our faithful and amazing readers “What are your favorite egg recipes?” They had such great ideas for egg recipes! I am sure I will put them to the test during the upcoming weeks! Over 1,000 readers answered this answer and I compiled the following 20 easy egg recipes! I started by the most popular ones! 1-Scrambled eggs : who doesn’t love them? This is one of the most popular egg recipes! I prepared my first scrambled eggs at 11 years old. My teacher gave me the following recipe and I wanted to try it: mix egg, ¼ cup of milk, butter and cook for few minutes in a pan! It was a huge success! 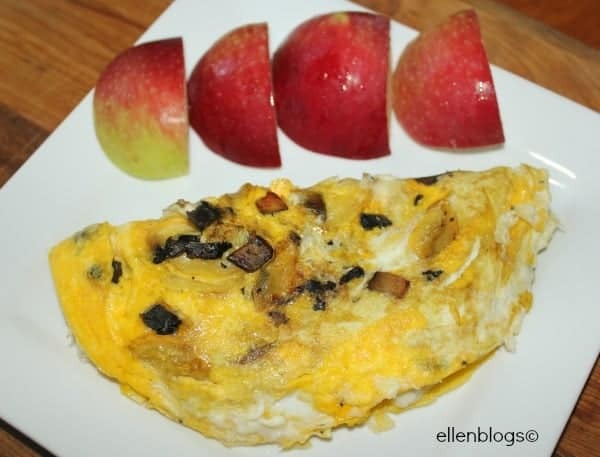 2-Veggie omelette : My kids love this easy and healthy omelette recipe! It’s perfect for breakfast or even for a quick meal. 3- Deviled eggs : I usually eat them at a breakfast restaurant but I have never dared to prepare them. I must give them a try. 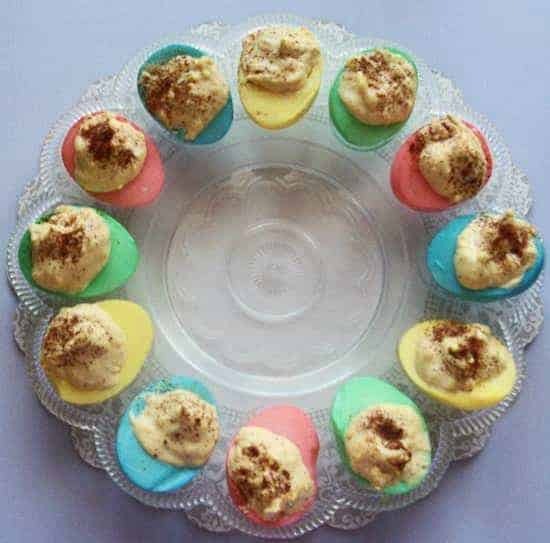 Our editor, Nikki, made some pastel deviled eggs last year that came out cute! 4-Wicked western Omelette : The first time I ate this was in Texas at the Gaylord Texan Resort last spring for my breakfast. I loved every bit of it! 5-Breakfast bakes: I have never tried them before! Pretty much anything goes here! Toss in eggs, biscuits, bacon, sausage, cheese and veggies. Or any combination of the ingredients! Bake them in the oven until brown, then serve. 6-French toast: It doesn’t get much easier than this. Just mix a little milk in with your egg in a bowl, add some cinnamon, dip your bread and stick in a frying pan or griddle. 6- Quiche : I love spinach quiche! While it can be long to prepare, you can prepare them ahead of time and freeze them. 10-Eggs Benedict : I have never succeeded in preparing them but I just love eating them! I don’t abuse though because they have lots of cream! 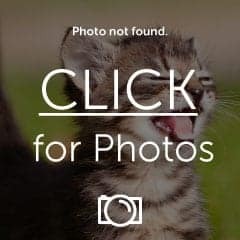 11-English potato salad with lots of eggs: This is my son’s favorite salad! 12-Fried potato omelet: I prepare it from time to time! It’s good for a quick and easy meal. 13-Breakfast burrito: I have never dared eating it! It is too much for my stomach! 14-Sunny side up eggs: Remember, consuming undercooked eggs can make you sick. Another way to go is over easy. You still get that perfect yolk for dipping toast but the white is done more. 15-Green eggs and ham: blend up spinach and green onions with egg whites. They taste delicious! Add a bit of bacon on the side, and it’s a great meal! We love Rachel Ray’s recipe. 16-Crepes: This my favorite dish! 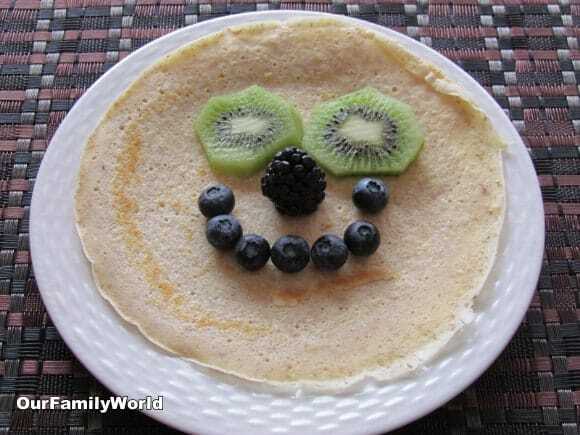 You can have prepare whole grain crepes or just regular crepes. You can top them with anything you want. What is your favorite easy egg recipe? can’t go wrong with eggs. I would love to fancy up my breakfasts with these recipes!! Sounds like a great cookbook! Those are some great choices! Love the spinach quiche! These are all beautiful. I love eggs. It is the one of the things everyone in my house will eat. Great idea with the colored deviled eggs. I love the quiche too. Wonderful. Wow – those rainbow eggs look cool. yummy, eggs are the must have! I love them in baking and scrambled eggs! Wow! Those all look and sound amazing! Thanks for sharing. Those dyed eggs are simply adorable! What a fun and festive treat. Which Beauty Products Should You Avoid During Pregnancy?